We are truly human when we act responsibly to restore harmony and act with love and compassion to restore truth, transparency and the equitable distribution of the resources endowed by our common Creator. This sentence was written in black ink on an 8×12 white sheet of paper from inside the state penitentiary in Ocilla, Georgia, by an 83-year old nun. Her name is Megan Rice. The American government considers her a criminal. In the early morning on Saturday, July 28, 2012, Rice broke into one of the most secure places in the world: the Y-12 National Security Complex in Oak Ridge, Tennessee. 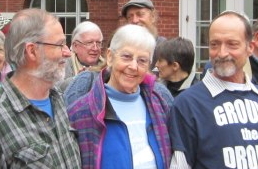 With her, two other Christian peace activists: Michael Walli and Greg Boertje-Obed. Using bolt cutters, they clipped holes in the chain-link fencing, crept past multiple layers—dogs, alarms, watchtowers, armed guards in the kill zone—into the inner chamber of an American nuclear weapons complex, the place that birthed the atomic bomb, the place that continues to birth our nation’s weapons of mass destruction. They unrolled spools of yellow crime scene tape. They had no plans to harm anyone, concerned even about the safety of the guard dogs on the premises. Using household hammers, they began to symbolically beat against the Oak Ridge facility in an attempt to make manifest the prophetic words of Isaiah: they shall turn their swords—or in this case, nuclear weapons—into ploughshares. Sister Rice, the 83-year-old nun, is considered a terrorist by the American government. She, Walli, and Boertje-Obed currently sit in the Ocilla jailhouse awaiting sentencing on January 28. They could receive anywhere from 10 to 30 years in prison. Civil disobedience is like a wedge. One disobeys the state in order to stay obedient to the higher law of morals and conscience. America has a vast and rich tradition in civil disobedience, beginning with the Founding Fathers and their tea party rejection of the British crown. America was born in disobedience, and has birthed an extensive family tree of conscience-based protests that run counter to the laws of the state. “The heritage of U. S. nonviolence thought is actually a heritage for the whole world,” writes Ira Chernus in American Nonviolence: The History of an Idea. The early eighteenth-century abolitionists like John Woolman was followed by the fiery protestations of nineteenth-century abolitionism, including the example set by Sojourner Truth and William Lloyd Garrison, who burned copies of the Constitution, calling it a “covenant with death” and “an agreement with Hell.” Garrison’s abolitionism was unapologetic, and when combined with the intellectual philosophy of Thoreau produced a nonviolent alternative history to the bloodshed of the nineteenth-century Civil War. Behind their radical leader Alice Paul, twentieth-century suffragists picketed the wartime White House of World War I before being arrested (“obstruction of traffic”), imprisoned, and beaten. In jail, they went on a hunger strike that, once publicized in the national press, led to the 19th Amendment and women’s voting rights. Against the backdrop of both World Wars came A. J. Muste and Dorothy Day, both Christian pacifists (she also an anarchist) whose faith in a nonviolent Christ was the catalyst for their call for a world without violence. “The most real thing in the universe, the most powerful, the most permanent is love,” Muste said. Then, like a symphonic overture, we encounter the civil rights movement—sit-ins, Freedom Riders, children’s marches, Rosa Parks, Dr. King—and the turning-over-the-tables influence it had on American social policy and our national identity. The Y-12 protestors come from this family tree of American nonviolence, rooted as it is in an all-encompassing value for life. Walli, who served two tours in Vietnam, lives with Catholic Workers in Washington, D.C.; Boertje-Obed, a carpenter, has a wife and daughter, and served in the Army during the early 1980s. Rice has been part of the Society of the Holy Child Jesus for decades. At some point in each of their lives, they encountered the philosophy of nonviolence, which eventually led them to their actions in Oak Ridge. “We acted in order to condemn the sin of making and trusting in weapons, but we love the workers and those who still believe in deterrence,” Boertje-Obed wrote. Nonviolence is ultimately pro-life, rejecting all forms of power, coercion, and force that diminish, devalue, and debase the dignity of others. From their Ocilla jail cell, they write knowingly of the proximity to Birmingham, where King wrote his famous jailhouse letter. It’s as if there was a spiritual link between the two. “I have lots of fond thoughts about him since he had integrity as a Christian and condemned nuclear weapons in 1959,” Walli wrote. What does it mean when our government considers each of the persons named above—from Garrison to Paul to King—a criminal? We find our own nation, which loves to speak of freedom and justice, refusing to recognize conscientious acts as legal. Too often, the American government criminalizes the conscience by responding to civil disobedience with force, handcuffs, and jail terms. The students who tried to integrate lunch counters were beaten and arrested; the suffragists who protested White House policy were arrested; countless others who have sought a more perfect union have been marginalized and criminalized. We then realize that moral reform does not originate with the state, but rather resides within conscientious objectors and their subversive patriotism. The Y-12 protest was rich with drama: blood, crime scene tape, and spiritual graffiti. Yet our attention needs to turn elsewhere. The real issue is not Rice and her bolt-cutter crimes. It is nuclear weapons and the United States’ role in their existence. Oak Ridge was born in the crucible of World War II. Cloaked in secrecy, the town was built as the backdrop for the Manhattan Project and U.S. atomic bomb production. Cold War fears led to the proliferation of nuclear weapons and a national policy that is both pioneering and regressive: our nuclear weapons arsenal leads the world while also existing as a perpetual threat to destroy it. “Inside the building was enough radioactive material to fuel over 10,000 nuclear bombs, which would end civilization many times over,” writes Dan Zak, in his beautiful Washington Post piece on Rice, Walli, and Boertje-Obed. The Federation of American Scientists estimates our current inventory to be 7,700 nuclear warheads, only slightly lower than Russia’s. Since 1940, America has spent nearly $10 trillion on its nuclear weapons program, and the Ploughshares Fund estimates the U.S. government will spend roughly $650 billion in the next ten years on our nuclear weapons program. In Oak Ridge, plans are underway to expand the facility. A recent U. S. Government Accountability Office report stated the possibility the plant won’t be completed until 2035 at a cost of $11 billion. Violence leads to more violence. For the activists, the mere presence of nuclear weapons mocks a Christian ethic that says to the world: lay down your arms. Nonviolence is an expression of a faith, one meant to honor and protect life, not threaten it with annihilation. “I’m Catholic and I know that Jesus Christ and the Blessed Mother do not have an arsenal of any kind,” Walli testified during the trial. In his letter, Boertje-Obed wrote that he believed their actions were successful. No one from Y-12 got hurt, including the guard dogs. Without having a clear map of where they were going past the fence, they were led—by the hand of God, he believes—to the building where they carried out all their actions of protest: the crime scene tape, the blood, the hammering. “The wall began to crumble,” Boertje-Obed wrote. Some have suggested it was a miracle—Boertje-Obed used that exact word—that the three made it inside the Y-12 complex, and such a claim certainly fits the standard of a miracle: an octogenarian with bolt cutters infiltrating one of the most secure places on earth. In her letters, Rice discusses the illegality of the entire place; to her, its existence violates the Nuremberg principles, U. N. charters, the Geneva Accords, and war crime policy. She said the messages they spray-painted were done to reveal one thing and one thing only. Boertje-Obed ended his letter with a suggestion to Americans. David Cook is the city columnist for the Times Free Press in Chattanooga, Tennessee. He may be reached at dcook@timesfreepress.com.